Mrs Lilian Cross runs the staff organisation and administration side of the surgery. We strive to give you the best possible care and attention. If you have any suggestions or are unhappy with our service, please speak to the practice manager. 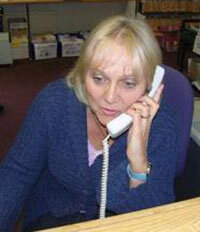 Mrs Nicky Harmes can follow up enquiries about referral letters, home visits and the like. Referrals to private hospital consultants should be arranged through an appointment with a GP, and please allow 3 clear working days from this time for referral letters to be ready.